Food, food, food, food, food! Is what most people hear when they travel with me. In all of my travels, food plays a crucial role to my enjoyment. As a vegetarian since birth, I’m always wary of eating out at restaurants. Luckily, I am blessed with a wonderful mother, who is the best chef in the world. However, when I hit the road, I am always excited to try other cultural foods! As you can imagine, being a vegetarian abroad can be quite complicated. Some countries think fish and chicken are not meat, therefore, it is okay for it to be in a vegetarian meal. I have to learn some key phrases with every foreign country I visit, to convey the entirety of my vegetarian-ess. With every mistake I make, I learn a lot to have a better experience the next time. Because of my continuously adventurous vegetarian taste buds, I have gotten to try amazing vegetarian dishes from around the world. Here are top three favorite countries’ dishes, in collage form. Nicaragua – Choosing a country from the many favorite foods I had in Central America was quite difficult. I chose Nicaragua purely because I had an amazing street food experience there. Shave ice desserts called granizado were all over the streets. Central American foods sometimes overlapped each other, so I was happy to find some of my favorite foods in neighboring countries. Some of my favorites are elotes (corn), traditional rice and beans con queso (with cheese) dishes, platanos (plantains), and pan (bread). Thailand – How do you beat $1 phad thai? Love the diversity of street foods in Bangkok. Also a great place for noodles and spicy food, which is right down my alley. 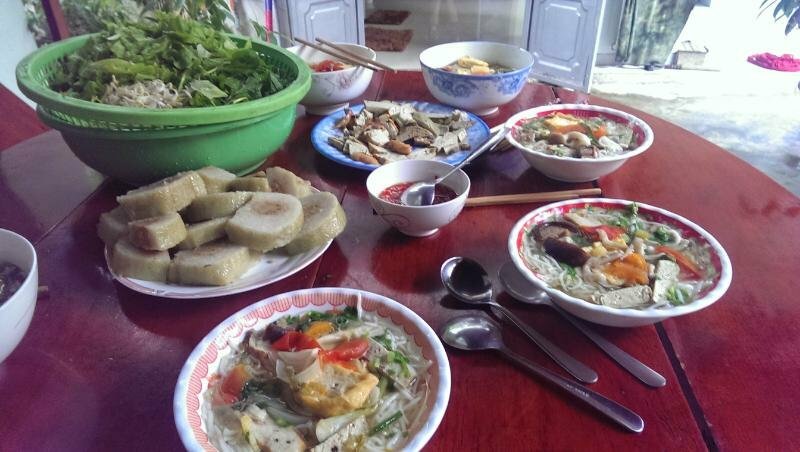 Vietnamese foods. Being Vietnamese by blood, I’m always partial to my native country’s cuisines. I am immensely proud of the variety of Vietnamese foods. It’s colorful, tasty, and full of culture. Japanese foods. As one of the most amazing cultures out there, they have so many creative dishes. 🙂 Home to sushi, green tea Kit Kat, soba noodles, and tempura, it’s possibly some of my favorite foods. Unfortunately, most their foods are not vegetarian friendly. Filipino foods. Raised in the Philippines, I came to love eating mangoes, bananacues (caramelized, roasted plantains), and various different vegetarian snack options. Thanks for reading!! What are your favorite foods??? Who else is doing the challenge? Hi Winta! Like you, I am a massive travel foodie. I was in Japan for my first trip in February and I’m just planning my first trip to Vietnam in October, so I loved your post. It’s made me so hungry I need to go and eat something! Oooh thank you, and yes fab, I’d love to connect and blog exchange with you sometime! And I’m going to look over the blogging challenge now to see if I can fit it in to my schedule. I’ve had all those foods, except for Nicaraguan food which sounds pretty good! I’ll be going to Thailand soon, and those pictures of food look delicious!! All of that food looks so amazing! Makes me hungry. Thank you for sharing the insights and wonderful pictures! Pingback: Collage Terminal | What's (in) the picture?